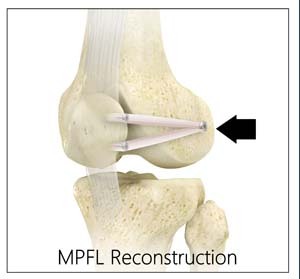 What is Medial Patellofemoral Ligament Reconstruction? Graft Selection and Harvest: Your surgeon will make a 4-6 cm skin incision over your knee, at the midpoint between the medial epicondyle and the medial aspect of the patella (kneecap). The underlying subcutaneous fat and fascia are cut apart to expose the adductor tendon. The tendon is then stripped using a tendon stripper and its free end is sutured. The diameter of the tendon graft is measured using a sizer.